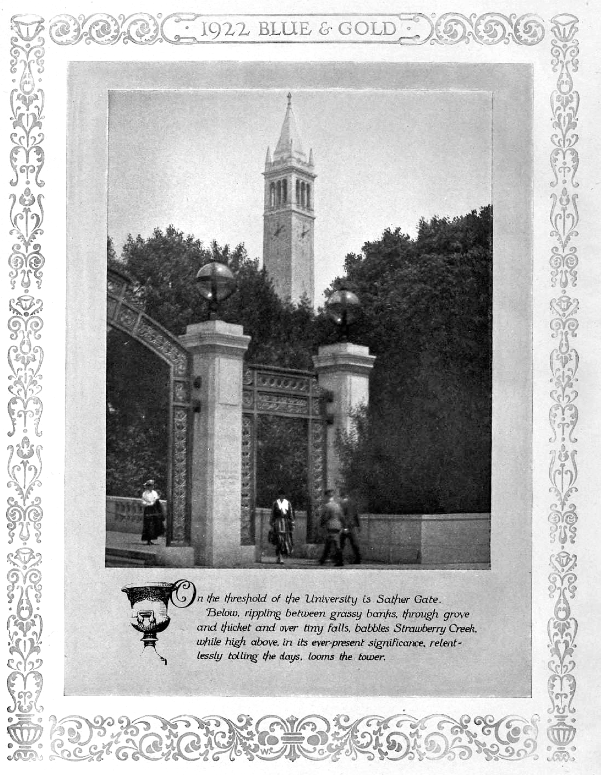 Sather Gate: The entrance to UC Berkeley, as it appeared around 1921. According to the Register, the average Berkeley temperatures were about 59 degrees in summer and 48 in winter. I’m not sure how reliable the publication’s information was, but today, average summer temperatures range into the low 70s! There were no dormitories maintained by the University. 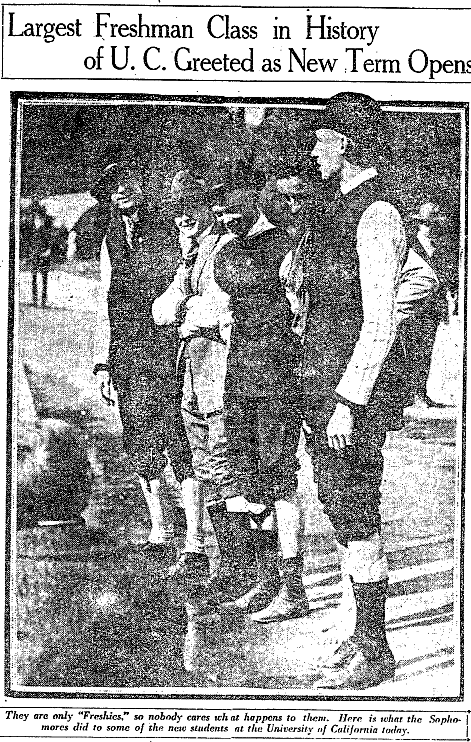 The cost of board and lodging in boarding houses in or near Berkeley was $40 to $55 a month; and in fraternities and students’ clubs from $30 to $50 a month. Students also commuted from Oakland and San Francisco, which Ursula may well have done her first year. 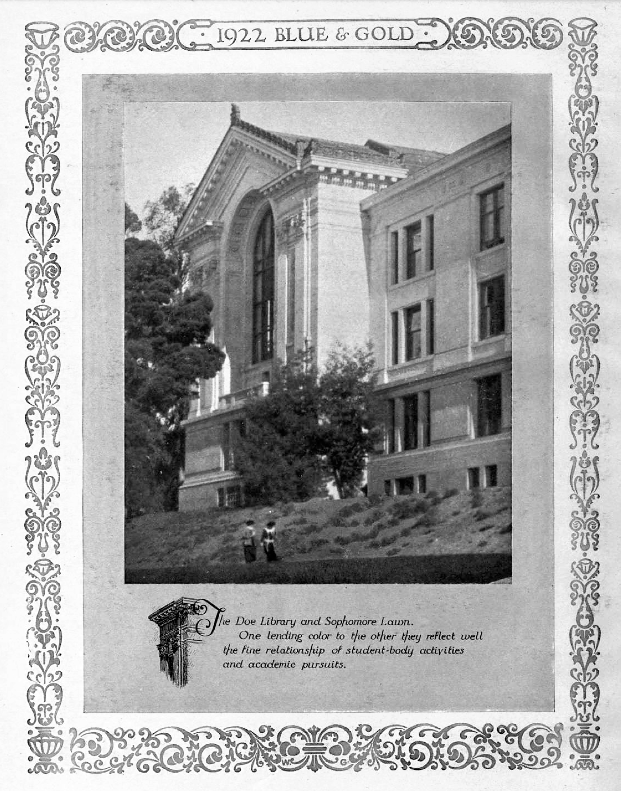 At more than 3,000 students, Ursula’s freshman class was the largest ever to enter UC Berkeley. At the time, an estimated 8,500 students were registered at the university; today, more than 36,000 attend. Berkeley was a 35-minute ride by train and ferry from San Francisco. The ordinary yearly expenses of a student in the academic departments, including personal expenses, was at least $750. By a very unscientific method (counting and averaging the number of men and women listed on just 12 pages of the senior class portraits from the 1924 yearbook), I’ve guesstimated the ratio of female to male students to be about 8.4 to 10. This surprised me, as less than 8 percent of the American female population at that time attended college. I’ll bet Ursula, with her curly hair, big eyes and dramatic talent, attracted her fair share of would-be beaus! 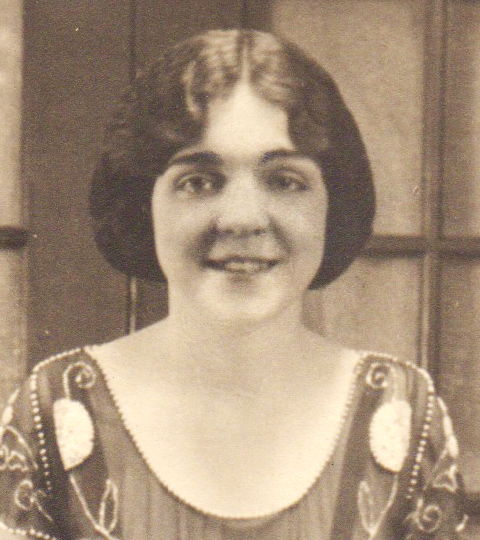 On August 18, 1919, 18-year-old Ursula joined the ranks of more than 3,000 new students entering the University of California, Berkeley. That morning in the campus’s outdoor amphitheater, president emeritus Dr. Benjamin Wheeler welcomed the largest freshman class ever to enter the state university. “The peril of coming to college is the peril of liberty and freedom,” he admonished the students, as reported in that evening’s Oakland Tribune. “…You can go back to Oakland and speed along the boulevards if you wish and attend gay parties in San Francisco, but you will pay for it later. Americans must have hard work. If they have not, they go to seed under it. You had better leave college if you cannot do things with a zest.” Such serious words for the incoming “Freshies”! I can’t wait to tell you about Ursula’s college years—I have found a trove of information and photos online in a few of the university’s “Blue and Gold” yearbooks from that period. We’ll start with a tour of the Berkeley campus, as Ursula surely did before enrolling. All of the black and white photos below are from the 1922 yearbook. 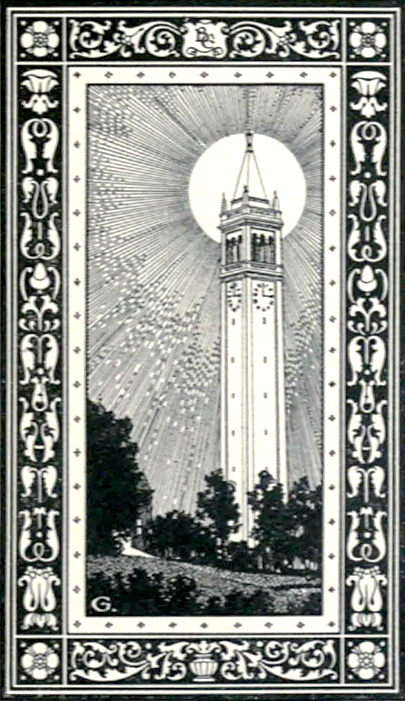 Completed in 1914 as a centerpiece for the UC Berkeley campus, the Campanile is the third-tallest bell and clock tower in the world, according to the UC Berkeley website. Visible for miles, this designated City of Berkeley Landmark is 107 feet tall and houses a carillon of 61 bells, on which you can still hear concerts played today. 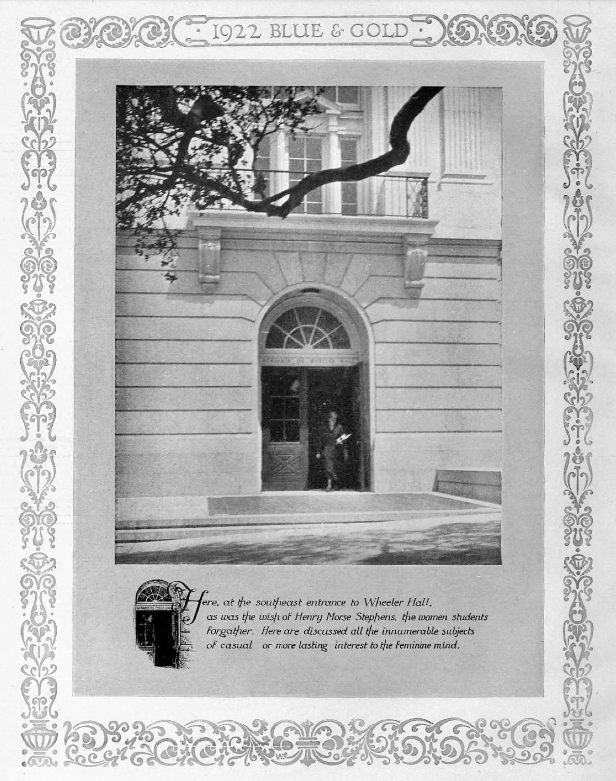 Home to the English department, Wheeler Hall was opened in 1917, just two years before Ursula entered the university. She surely took classes there as a student of drama, and perhaps gathered with friends under “Wheeler Oak,” a tree that once shaded a portion Wheeler Hall steps and was a favorite meeting place for students back then. 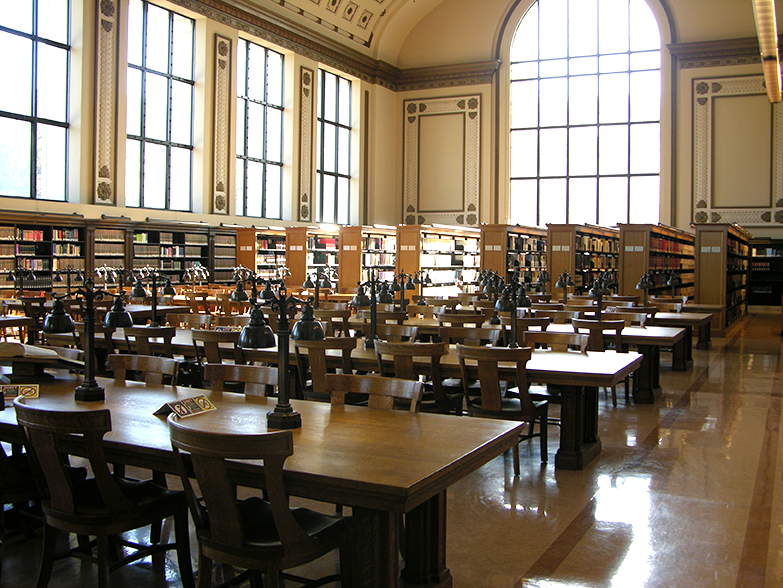 Doe Library, built in the Classical Revival style and completed in 1911, was (and is) the main undergraduate library. 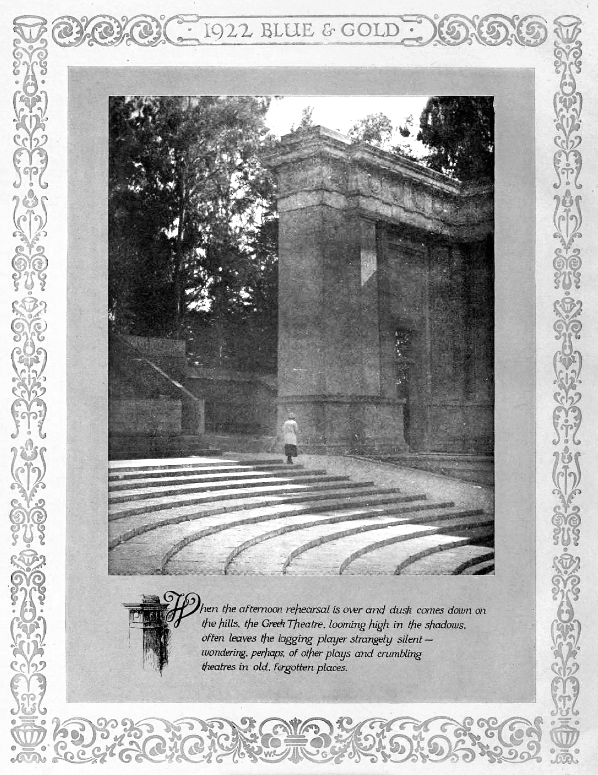 A stage for many student productions (including some in which Ursula appeared) as well as professional actors, the Greek Theatre was built in 1903 on the site of a rough outdoor bowl already in use as an amphitheater since 1894. Modeled on architecture from ancient Greece, the theater was gifted to the university by William Randolph Hearst. Today, the Greek Theatre hosts The Berkeley Jazz Festival, pop, rock, and world music concerts, UC Berkeley graduation ceremonies, occasional addresses by noted speakers, and other events.